Cannabis is not only the most widely used illicit drug worldwide but is also regularly consumed along with ethanol. In previous studies, it was assumed that cannabis users develop cross-tolerance to ethanol effects. The present study was designed to compare the effects of ethanol in comparison to and in combination with a cannabis joint and investigate changes in pharmacokinetics. In this study, 19 heavy cannabis users participated and received three alcohol dosing conditions that were calculated to achieve steady blood alcohol concentrations (BAC) of about 0, 0.5 and 0.7 g/l during a 5-h time window. Subjects smoked a Δ9-tetrahydrocannabinol (THC) cigarette (400 μg/kg) 3 h post-onset of alcohol dosing. Blood samples were taken between 0 and 4 h after smoking. During the first hour, samples were collected every 15 min and every 30 min thereafter. Mean steady-state BACs reached 0, 0.36 and 0.5 g/l. The apparent elimination half-life of THC was slightly prolonged (1.59 vs. 1.93 h, p < 0.05) and the concentration 1 h after smoking was slightly lower (24 vs. 17 ng/ml, p < 0.05) with the higher ethanol dose. The prolonged THC elimination might be explained by a small ethanol-mediated change in distribution to and from deep compartments. Concentrations and pharmacokinetics of 11-hydroxy-THC and 11-nor-9-carboxy-THC (THCA) were not significantly influenced by ethanol. However, THCA concentrations appeared lower in both ethanol conditions, which might also be attributable to changes in distribution. Though not significant in the present study, this might be relevant in the interpretation of cannabinoid concentrations in blood. 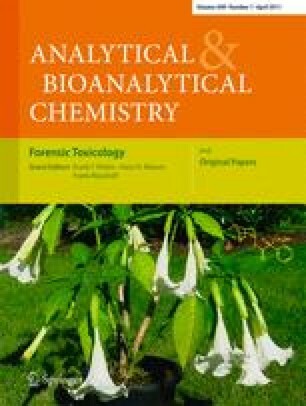 Published in the special issue Forensic Toxicology with Guest Editors Frank T. Peters, Hans H. Maurer, and Frank Musshoff. This study was supported by a grant from the German Society “Bund gegen Alkohol und Drogen im Straßenverkehr e.V.”.